Environmentally friendly crate redesign results in 53% weight reduction. Click the image to view the PDF of the case study. 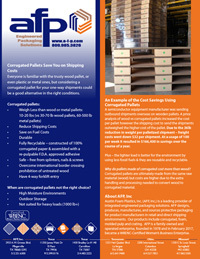 Corrugated pallets save you on shipping costs - considering lightweight, recyclable, corrugated pallets for your one-way shipments can give significant freight savings. Click the image to view the PDF of the case study. 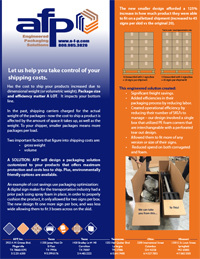 Take control of your shipping costs. 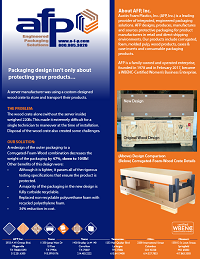 Customized packaging solutions can help offset shipping cost increases caused by dimensional weight pricing. Click the image to view the PDF of the case study. Environmentally friendly crate redesign results in 47% weight reduction. Click the image to view the PDF of the case study. 2933 A. W. Grimes Blvd.